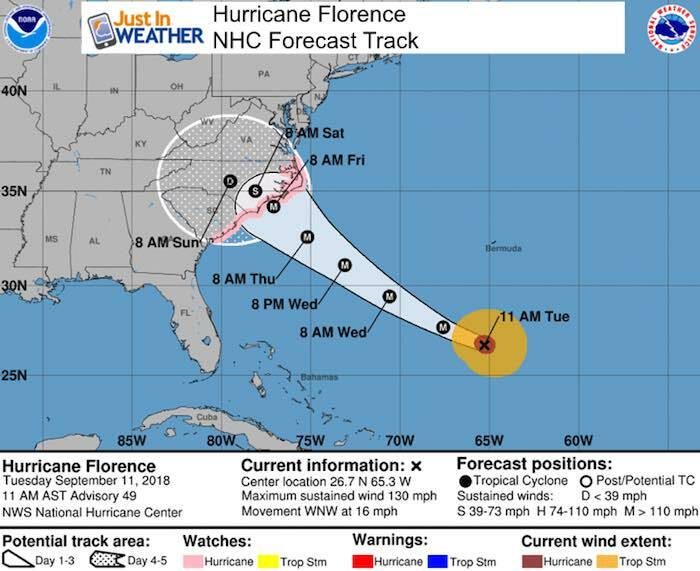 Hurricane Florence is still going strong with 130 mph winds. It lost some speed overnight as it undergoes an eye wall replacement cycle. But it should regain back to or above 140 mph sustained winds in the next day. The size of the storm is almost as important as track to consider with landfall. I am writing this with perspective on Maryland since that is the northern edge of where a State of Emergency has been issued. There is a lot of concern on the Chesapeake Bay and reminders of Isabel in 2003. This is not the same storm but rising water is a real potential. Rainfall and wind may be much less than you are expecting after being bombarded with endless news reports and online posts (like mine). Hurricane Force Winds (over 74 mph) reach 40 miles from the center. 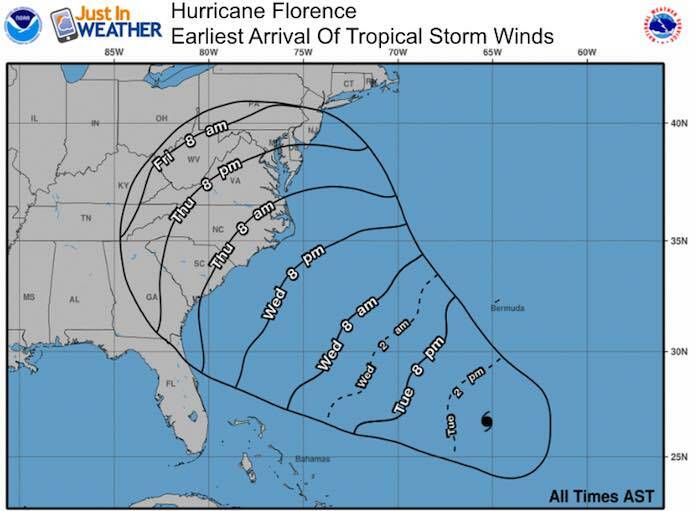 Tropical Storm Force Winds (over 39 mph) reach 150 miles away. The east side seems to be eroded away a little, but the core eye wall appears to be clearing out again as the storm is about to regain some intensity. The HWRF shows a Thursday night hit, this may adjust based on faster forward speed today. High Pressure in New England and our old front not shown here all all helping to steer Florence inland and NOT up the coast. There have been many questions about it getting closer. If anything I have seen a push farther south. 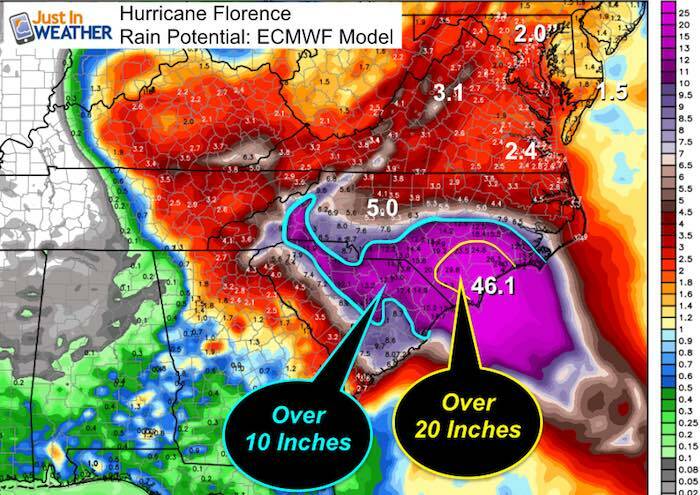 The European Model is leaning towards possibly a South Carolina landfall. I’ll show that update later this afternoon. When does this show up? The earliest arrival of tropical storm force winds (over 39 mph) is Wednesday night into Thursday morning. You see Maryland is included in the main cone… This can be deceiving. Check out the maps below. While the storm will spread out as it makes landfall, that is still a far distance from Maryland. Here is a look at the forecast landfall from NOAA and odds for winds reaching tropical storm intensity of 39 mph or higher. Notice Ocean City has 25% chance of steady winds getting to tropical storm intensity, but there could be gusts that high. Less of a chance near Annapolis (25%) and Baltimore (15%) , but St. Mary’s (35%) may get stronger winds than OCMD. 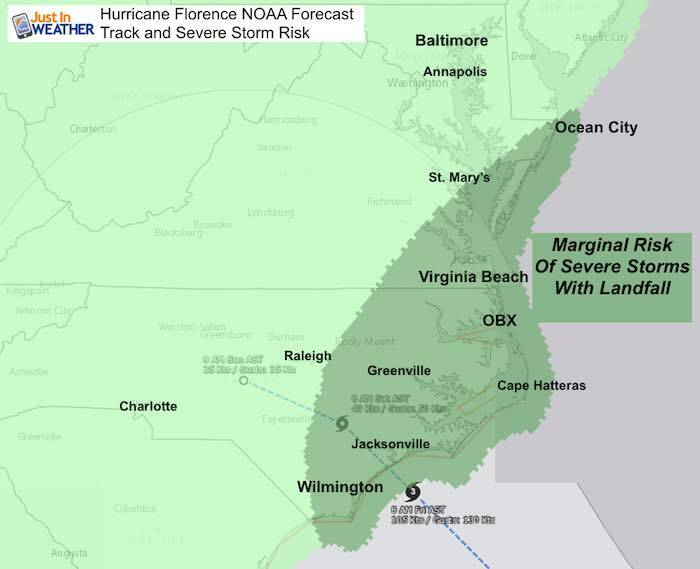 Virginia Beach and southward towards OBX dramatically increased the likelihood of damaging winds. 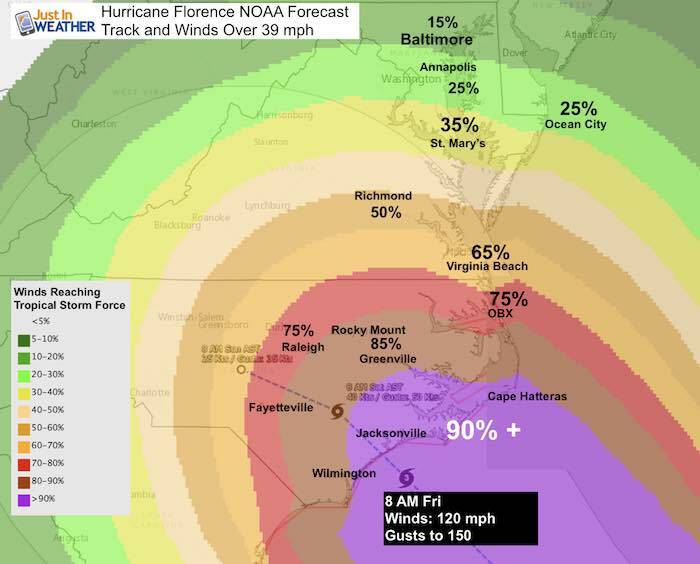 This map is the NOAA plot with landfall Friday morning. This may be too slow. This is the map I showed this morning online. The European Model does indicated that there may be some areas upwards of 40 inches of rain… should this stall. But the takeaway for Maryland is that the rainfall on this map also includes what we have today and tomorrow not part of Florence. We could miss out on the main rain especially if it trends on the southern part of the suggested cone. I have had a lot of question about the weekend. If you are heading between Virginia Beach, OBX, or Florida driving, I would have a plan B. The landfall may flood and damage roads. If you re flying, Florida will not have a problem, but there could be delays due to turbulence getting there. 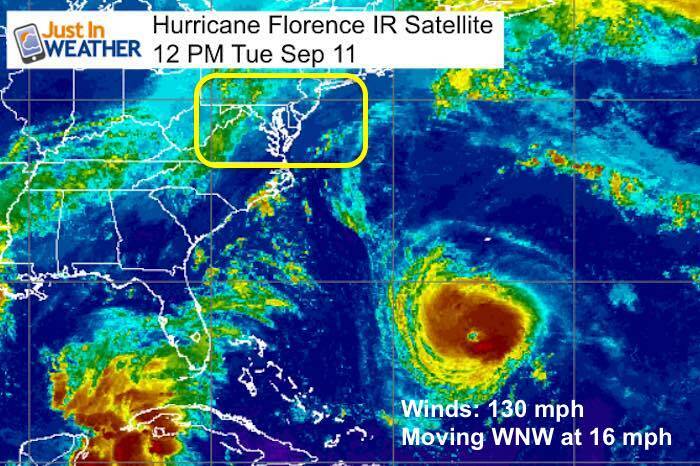 Flights will likely fly around Florence, but the atmosphere will give a very bumpy ride. 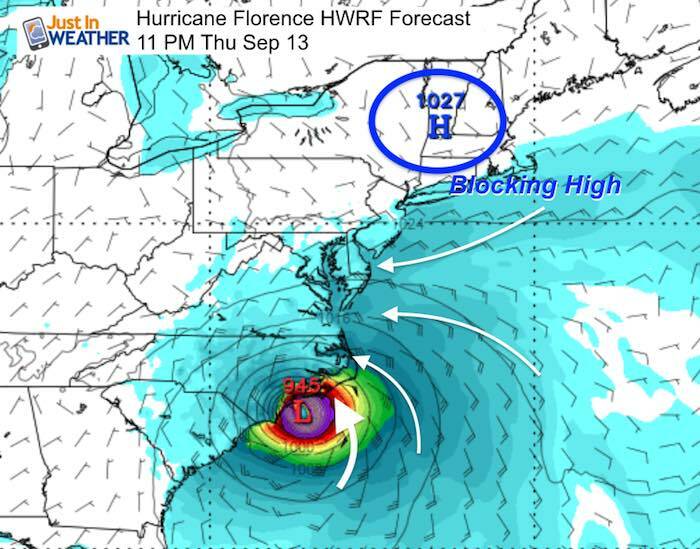 This HWRF Model is doing a good job and I will likely stick with this from here on in…Landfall may possibly shift a little south of Wilmington, NC. But then… the storm moves due west or southwest into South Carolina. That is farther away from Maryland, like keeping the bulk of the wind and rain there as well. There will be high water on the Chesapeake Bay. This is already an issue plus the hurricane will hinder the low tide from flowing out. Wind direction will be from the east, but not the dreaded southeast up the Bay that we saw with Isabel. Basically, shoreline areas still need to be concerned with high water, but the worst is likely to not hit us. We have had more than our share this summer. This also means it will be worst in North and South Carolina.